SOUTHAMPTON, N.Y. — Viewed from on high, Shinnecock Hills Golf Club is a rectangle of linksland, American-style. It is bordered on its south side by a four-lane truck route, Route 27, and on its north side by a shady country lane with $3 million houses with cedar-shingle roofs called Shrubland Road. Southampton Golf Club lies to its east and the National Golf Links of America to its west. Shinnecock Hills — its given name comes from a local Indian tribe and its surname from various glacial deposits — looks like a pale-green camping blanket on Google Earth. But this week it is anything but sleepy. It is the epicenter of the sporting world. Tiger Woods is trying to win his first major in a decade, Phil Mickelson is trying to complete the career Grand Slam, and the USGA is trying to prove it can stage a national championship without a single major controversy. Let the good times roll. Watching on TV, it's easy to forget that there's a world beyond those borders. But there is. Across Route 27 from the entrance to the Southampton Golf Club is a driving range with miniature golf, batting cages and soft serve ice cream. For $18 you can get a big bucket of reasonably new Top-Flites and hit balls in the same east wind that Tiger Woods has been practicing in. On Wednesday morning, a few miles east from the range, at a breakfast nook on Main Street in downtown Southampton, a kitchen worker, dark-haired and dark-skinned, emerged from the back and showed off his U.S. Open grounds pass to his coworkers. One of counter women said, "Bernardo, look at you! Are you going to work it or watch?" Among the locals, there's a lot of both. On the other side of the range, the Shinnecock Nation has its own U.S. Open parking operation to babysit the cars belonging to spectators traipsing along a golf course built by members of the Shinnecock Nation on land that to was — and therefore is — a tribal burial grounds. For decades, the golf club's caddie yard, kitchen and maintenance crew was filled with workers of Shinnecock ancestry, although that is far less true today than it once was. In the Open's merchandise tent you can buy $75 polyester golf shirts bearing the club's logo, a nameless Shinnecock Indian in full profile and headdress, stitched into the left chest by a Chinese sewing machine. On Monday, the USGA issued a press release announcing that the USGA would be building a golf facility on Shinnecock land "for Shinnecock golf enthusiasts and juniors to learn to play the game and enjoy it for a lifetime." (That last bit might be promising too much, but a press release can dream, right?) The facility will be named for Oscar Bunn, a Shinnecock Indian and woodcarver who played in the 1896 U.S. Open at Shinnecock Hills. A black golfer, John Shippen, played in that Open, too. They were not warmly welcomed by their fellow competitors. At Woods's Tuesday press conference, a reporter mentioned Shippen's name in a question, but he did not seem to be familiar with it. Woods is intimately familiar with Raymond Floyd's win in 1986, Corey Pavin's in 1995 and Retief Goosen's in 2004. Woods has an incredible reservoir of golf history deposited underneath his Nike-capped head. He also has a sustained appreciation for his father's history as an Army veteran and an abiding awareness of his own Native American ancestry. (Woods's father, Earl, had a grandparent who was Cherokee.) There was a moment — for Woods and for others — late on Tuesday morning when various unlikely off-the-course factors came together for a brief, interesting and shining moment. A few minutes before Woods's 11 a.m. press conference, Craig Annis, the USGA's new head of communications, hurriedly arranged for a small group of cushioned banquet chairs assembled just off the front row and near the exit door. In walked a group of about nine Shinnecock Indians and Annis enthusiastically tapped the back seat of one of them, beaconing a man named Lubin Hunter to take a seat. Mr. Hunter — he's earned the honorific and a whole lot more — is 101 years old, a member of the Shinnecock Nation and a World War II vet. He was white-bearded, upright, alert, ambulatory and dressed nattily, in a white sweater and a black U.S. Army Air Corps hat. He was surrounded by family members, all far younger than he, and was about 20 feet from Woods. A leader of the Shinnecock nation had asked Annis if Mr. Hunter could meet his favorite golfer and the visit was arranged. Woods concluded his press conference with a reference to how, less than a year ago, he didn't know if he would ever compete in a golf tournament again. He said, "To go from there to where I'm at now, I had no expectation of getting this far." Mr. Hunter could likely say the same. Woods exited stage left and through a side door where a dusty Lexus, a USGA loaner, with Texas plates awaited him, as did David Marr, a Shinnecock Hills member and a USGA interviewer whose father, Dave Marr, was a PGA champion and Ryder Cupper. 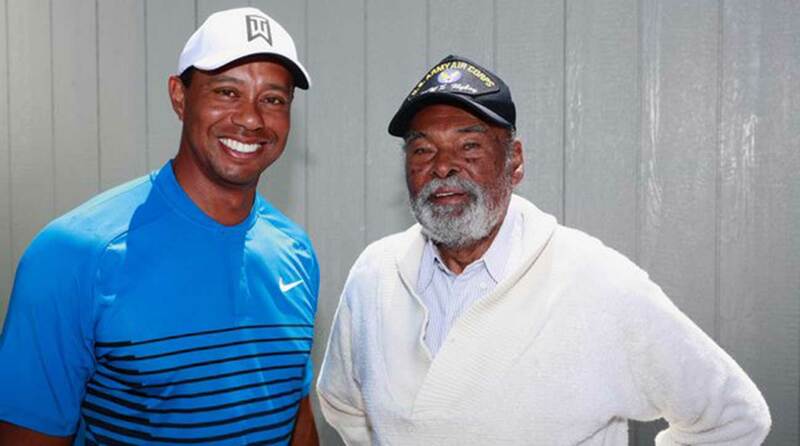 Before Woods did a quick stand-up interview with Marr, and before he climbed effortlessly into the elevated passenger seat of the Lexus, Woods posed for a picture with Mr. Hunter, who was a gunner on B-17s over the Pacific during World War II. You can hear the sorrow for lost lives, regardless of uniform, in his interviews, easily found on the internet. You can also see a photo of a beaming Woods standing shoulder-to-shoulder with Mr. Hunter, a man old enough to be his great grandfather. Mr. Hunter was a caddie at Shinnecock Hills as a boy and many years later a founder of an association of Shinnecock golfers. He was a miler at Southampton High, a graduate of Brooklyn College and for a few minutes the focus of the golfer on whom the wide world of sports will be focusing on when this 118th U.S. Open gets underway, within the borders defined by two roads and two golf courses.